Definition at line 400 of file iterative_linear_solver.h. Definition at line 406 of file iterative_linear_solver.h. Definition at line 412 of file iterative_linear_solver.h. Definition at line 418 of file iterative_linear_solver.h. Definition at line 509 of file iterative_linear_solver.h. References oomph::BiCGStab< MATRIX >::Matrix_can_be_deleted, and oomph::BiCGStab< MATRIX >::Matrix_pt. Referenced by oomph::BiCGStab< MATRIX >::disable_resolve(), and oomph::BiCGStab< MATRIX >::~BiCGStab(). Definition at line 432 of file iterative_linear_solver.h. References oomph::BiCGStab< MATRIX >::clean_up_memory(), and oomph::LinearSolver::disable_resolve(). Definition at line 495 of file iterative_linear_solver.h. Definition at line 424 of file iterative_linear_solver.h. Definition at line 69 of file iterative_linear_solver.cc. Definition at line 100 of file iterative_linear_solver.cc. References oomph::DoubleVector::build(), oomph::DoubleVector::built(), oomph::DistributableLinearAlgebraObject::distribution_pt(), oomph::Problem::get_jacobian(), oomph::oomph_info, oomph::DoubleVector::redistribute(), and oomph::TimingHelpers::timer(). Definition at line 445 of file iterative_linear_solver.h. References oomph::DistributableLinearAlgebraObject::build_distribution(), oomph::DistributableLinearAlgebraObject::distribution_pt(), oomph::LinearSolver::Enable_resolve, oomph::BiCGStab< MATRIX >::Matrix_can_be_deleted, oomph::BiCGStab< MATRIX >::Matrix_pt, oomph::BiCGStab< MATRIX >::Resolving, and oomph::BiCGStab< MATRIX >::solve_helper(). Definition at line 480 of file iterative_linear_solver.h. 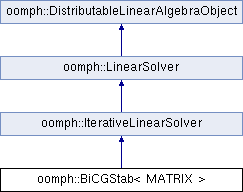 Linear-algebra-type solver: Takes pointer to a matrix and rhs vector and returns the solution of the linear system. Algorithm and variable names based on "Numerical Linear Algebra for High-Performance Computers" by Dongarra, Duff, Sorensen & van der Vorst. SIAM (1998), page 185. Definition at line 185 of file iterative_linear_solver.cc. References oomph::DoubleVector::build(), oomph::DoubleVector::built(), oomph::LinearAlgebraDistribution::built(), oomph::LinearAlgebraDistribution::distributed(), oomph::DistributableLinearAlgebraObject::distribution_pt(), oomph::DoubleVector::dot(), i, oomph::DoubleVector::initialise(), oomph::BlackBoxFDNewtonSolver::Max_iter, oomph::DoubleMatrixBase::multiply(), oomph::DoubleMatrixBase::ncol(), oomph::DoubleVector::norm(), oomph::DoubleMatrixBase::nrow(), oomph::DistributableLinearAlgebraObject::nrow(), oomph::oomph_info, s, oomph::Global_string_for_annotation::string(), t, and oomph::TimingHelpers::timer(). Referenced by oomph::BiCGStab< MATRIX >::solve(). Definition at line 519 of file iterative_linear_solver.h. Referenced by oomph::BiCGStab< MATRIX >::iterations(). Definition at line 530 of file iterative_linear_solver.h. Referenced by oomph::BiCGStab< MATRIX >::clean_up_memory(), and oomph::BiCGStab< MATRIX >::solve(). Definition at line 522 of file iterative_linear_solver.h. Definition at line 526 of file iterative_linear_solver.h.